Siavash, a man in his late 30s, left Iran years ago and lives in Sweden with his wife and two children. One day he realizes he wants to go back for a visit and decides the best place to do so is Qeshm Island, because, despite belonging to Iran, it is a free port and doesn’t require a visa. Being there he feels he is in Iran, but it does not fully satisfy his homesickness and nostalgia, because his old home is on the other side of the island. He buys a mobile phone and with it manages to contact his friend Hossein in Khorramabad. Hossein asks him not to leave the island and explains to him the dangers if he were to come back. Siavash meets a young man, Abdo, who is smuggling goods. He also encounters a group of men and women determined to escape from Iran. The sea guards are pursuing them as they wander around the island. After Abdo does not return from one of his smuggling trips, Siavash decides to leave the island, even if it means that he will be arrested. One night he hires a man to take him by boat to the other side, but Hossein, who remains in constant communication with him, asks him not to come, to avoid creating problems for himself. Hossein, whom we never see during the film, only hearing his voice, tells Siavash that he will rent a van in their native city of Lorestan and go, along with a group of musicians who play traditional music to Bandar Abass shore to wait for Siavash. Hearing Siavash’s phone conversation with Hossein and gleaning that the trip could lead to trouble, the owner of the boat decides to turn back, but after Siavash’s pleading, he agrees to stop near the shore for a short period of time. As Siavash sits in the boat in the middle of the night, he looks anxiously toward the shore and can see his friend Hossein standing there, looking out to the sea, while the musicians play their traditional Lor music. Suddenly Siavash leaps into the water to try to make it to shore to see his friend, but sadly he does not know how to swim. The boatman pulls him back into the boat. They slowly sail away into the darkness of the sea as the music of his native land plays in the distance. Silence of the Sea is now available on DVD from Pathfinder Pictures. It can be ordered from Amazon, Netflix, direct from IFVC.com or at any of your finer video outlets. The film was given a theatrical release at the Vine Theater on April 25, 2008. 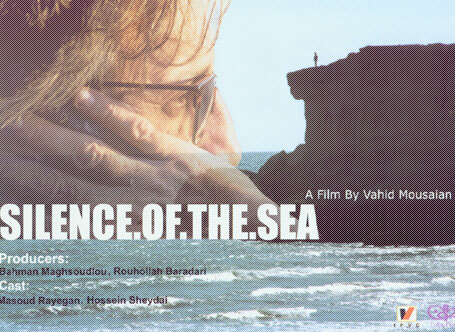 The film was also screened on November 17, 2008 at Kanoon Iranian in Washington. Two months later on January 30, 2009, it was screened at the Iranian Association of Boston along with Mr. Maghsoudlou’s short film Ardeshir Mohasses & His Caricatures. Mr. Maghsoudlou spoke and answered questions at both events.